WCDS faculty members Jaclyn Lawall and April Heddleston are excited to share their summer learning with students. 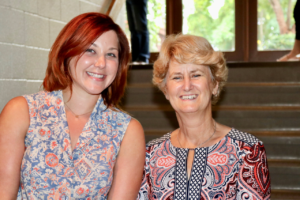 A number of Wakefield Country Day School faculty members became students again as they attended summer workshops and classes to enhance their teaching. Through a consortium with Rappahannock County Public Schools and Lord Fairfax Community College, teachers Nikki Brady and Amanda Hoffman joined the “Teach Like a Pirate Book Study” to find a treasure of great ideas to enhance student engagement in class. Math teacher Jaclyn Lawall enrolled in a calculus and analytic geometry class that focused on the study and application of limits, derivatives, differentials, and integration with a brief history thrown in. Trish Mullins studied US History at Lord Fairfax Community College, and our upper school Spanish teacher, Sñr. Tisera, kept the role of teacher for the summer months, albeit in a different classroom. For the third time, Gustavo Tisera spent his summer teaching full-immersion Spanish at the Governor’s Foreign Language Academy at Washington & Lee University in Lexington, VA, during June and July. Teachers also spent the summer months obtaining or renewing certifications. Third grade teacher Becky Ernest renewed her Collegiate Professional License (Certified in Pre-K – 6th grade) and achieved certification in Dyslexia Awareness, Child Abuse and Neglect (Recognizing, Reporting and Responding for Educators), CPR/Child First Aid/AED, MAT IS, and MAT Diabetes. Nikki Brady also earned the MAT Diabetes certification.